3M had a nice press release and product usage from the NASCAR race tracks this week. 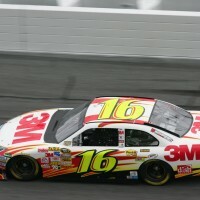 Greg Biffle is a veteran Nascar driver with major sponsors such as Ford, 3M, American Red Cross, and Coca Cola. In racing, where all specifications matter, and every little item added to a race car is scrutinized, the Biffle team has added 3M Crystalline 90 film to the cars. This is a testament to the clarity of the film, low weight, and heat-rejection performance. 3M Crystalline is a third generation film with 90+% infra-red rejection capability. Even the 90% VLT version of the film blocks around 40% of solar heat. Pretty good performance for any vehicle.